It’s all over but the crying. 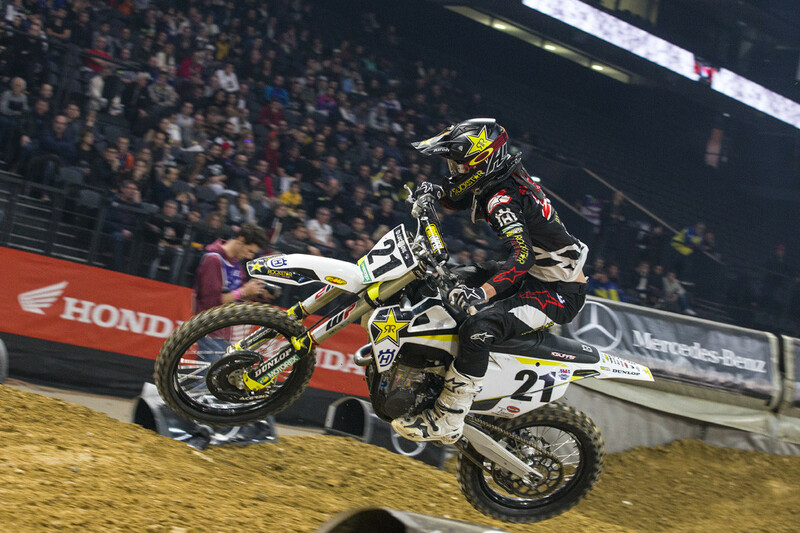 The 2018 King of Paris Supercross is Rockstar Energy Husqvarna’s Jason Anderson who went 3-1-1 today in the races to back up his 1-3-1 from Saturday. The 2018 Monster Energy Supercross Champion showed that he’s on his game as he took off with the final race of the night (the final race is much longer than the other two). Anderson used good starts, incredible corner speed, and his usual aggression to grab the overall and he was the best rider of the weekend. Strangely enough his qualifying times were never good enough to top the charts, or even be in the top three, but when the gate dropped, he was very, very good. Once again on the same basic track that turned much drier than last night, it was JGR/Yoshimura Suzuki’s Justin Hill that was fast in qualifying and the Superpole contest. He was the only American rider that was able to challenge hometown rider Dylan Ferrandis, who qualified fastest and took a very popular Superpole win. As far as outright speed for one lap, Ferrandis and Hill didn’t have any equals. The two riders that were the surprise of the weekend were Anderson’s teammate Zach Osborne who got better and better each race and Smartop/Bullfrog Spas/MotoConcepts Honda’s Vince Friese who showed his fourth in the last moto at the Monster Energy Cup was deserved. Friese scored a second behind Osborne (whose starts were on point all weekend) in the first semifinal of the night while Anderson trailed in third. Ferrandis was second early on but washed the front out and spent the rest of the weekend catching up from bad gate picks and a first turn fall. The second semifinal might have been the best race of the night. Justin Brayton bemoaned his lack of starts on night one but Smartop/Bullfrog Spas/MotoConcepts team manager Tony Alessi told us that the #10 would get better starts today and he was right. Brayton pulled the holeshot, got passed by Anderson right away then zapped the #21 in the very next turn. 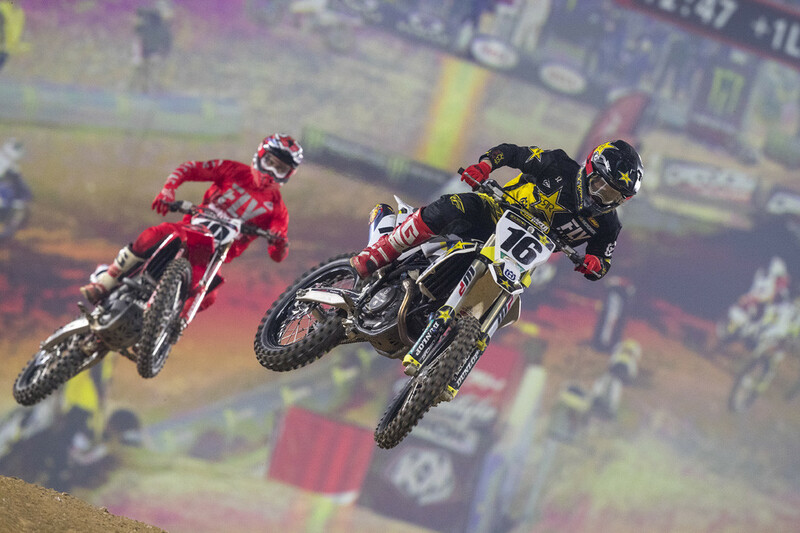 From there Anderson stalked Brayton for most of the race as both riders pushed each other and Osborne lingered behind. Brayton was trying to protect the insides from the aggressive Anderson while Anderson was trying insides and outsides to get by Brayton. Eventually Brayton broke and Anderson shot by. Osborne was next to get Brayton and at times, Osborne made some time up on Anderson. It was, as we said, the best race of the day. 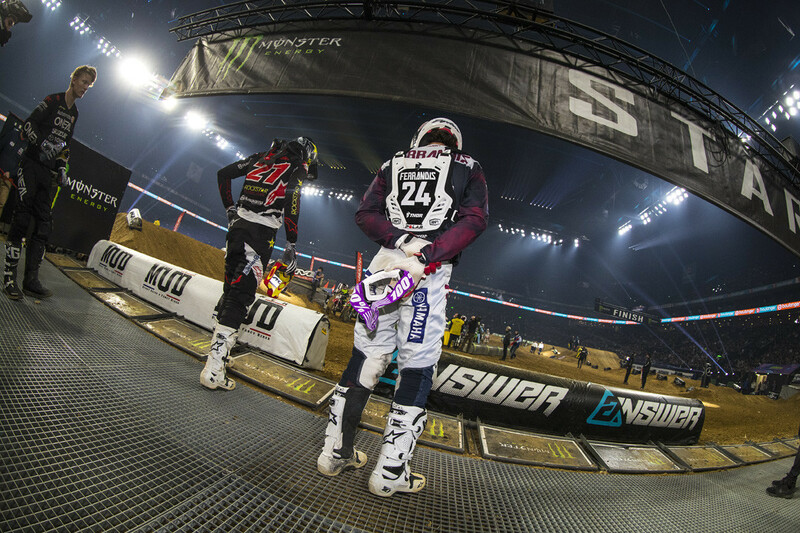 In the third race of the night, it was all Anderson after he got by Brayton again. Anderson had a huge lead as Brayton faded a bit, Osborne got a flat tire, Ferrandis was working up from a crash, and Friese didn’t get his usual good start. The final race was a bit of a snoozer and Anderson easily took the King of Paris crown. The mood was a bit somber as JGR/Yoshimura Suzuki’s Weston Peick remained in hospital following a bad crash on Saturday. You can read an update on Peick here. That’s all we know as of right now. In the SX2 class it was Bud Racing Kawasaki’s Jace Owen who took two out of the three mains to add to his two wins last night and take the Prince of Paris. Owen used great starts and solid riding (I don’t know if I saw him make one mistake) to easily best the rest of the field including American Cameron McAdoo who was certainly fast but couldn’t get starts and crashed a couple of times. All in all it was a deep field of American riders in Paris and a great show but Anderson showed why he’ll have the number one come Anaheim 1.